Last week I started a wedding garter. I’m using a pattern I found on Ravelry called “Skinny Lace Wedding Garter,” and I can’t link to it since it’s only available in pdf format. A quick search on Rav will bring it up, though. I’ve completed about 3.5 inches of the garter. I’m shooting for 22 or 23 inches. I want lots of ruffling! 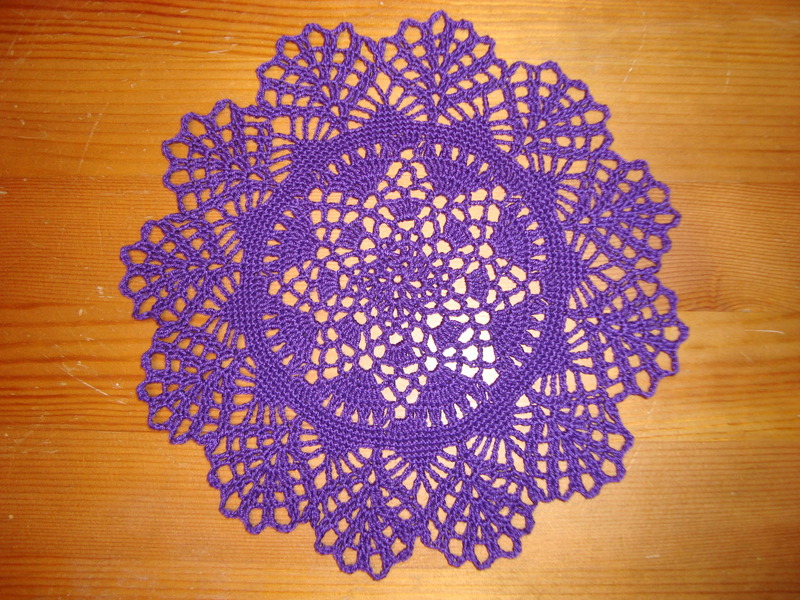 Last Friday I finished my first “centerpiece” doily. The pattern is called Winter’s First Snow and can be found here. I used size 10 cotton thread in “Deep Purple” and a 1.80mm steel hook. 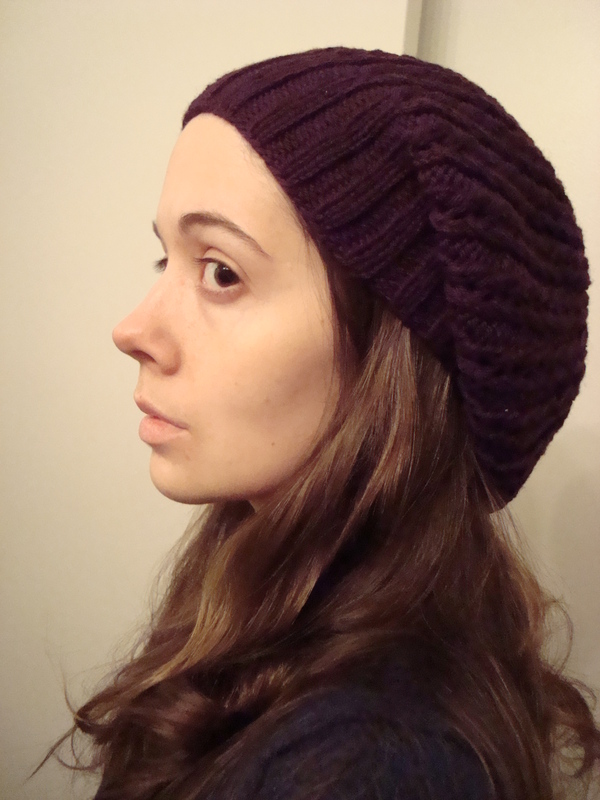 I finished Anne’s Intuitive hat last Sunday! As always, I’ll share some photos with you. Me - modeling Anne's Intuitive Hat. So slouchy! And now, the details. I started with 100 stitches due to my yarn choice (Cascade 220). I knit 3 inches of ribbing on size 5 needles before beginning the lace pattern on size 8 needles. (I knit about 7 inches of the lace pattern, which is what the pattern said to do.) I found that because I changed the stitch count, I did not need to move the marker (as the pattern requested) during Row 3 of the decreases. I’m still working on Anne’s Intuitive hat. Yesterday it dawned on me that the hat is reversible. (That’s what I get for not reading the pattern in its entirety.) Now I have to be careful about weaving in the ends. Anyway, I just thought I should offer an updated picture since the last one was pretty pathetic. So, without further ado, here is my progress. This hat sure is a yarn eater. I hope I can make the 7 inches of lace called for before decreasing. I promised Anne the hat would be super slouchy, and I definitely want to deliver! Oh I did it again! I started another non-Christmas project! This time it’s a slouchy hat for my friend, Anne. She’s been helping me deal with my medical troubles lately, so I think she’s very deserving of a handknit hat. The pattern is called Intuitive, and it can be found for free on Ravelry. I’m using Cascade 220 wool and sizes 5 and 8 needles to knit the hat. The yarn is a deep purple color. The website doesn’t give it an actual name, just a code, so take my word for it. I’ve modified the stitch count a bit to accommodate for my heavier yarn choice. I’ll go into more detail about my mods in my “Finished” post. 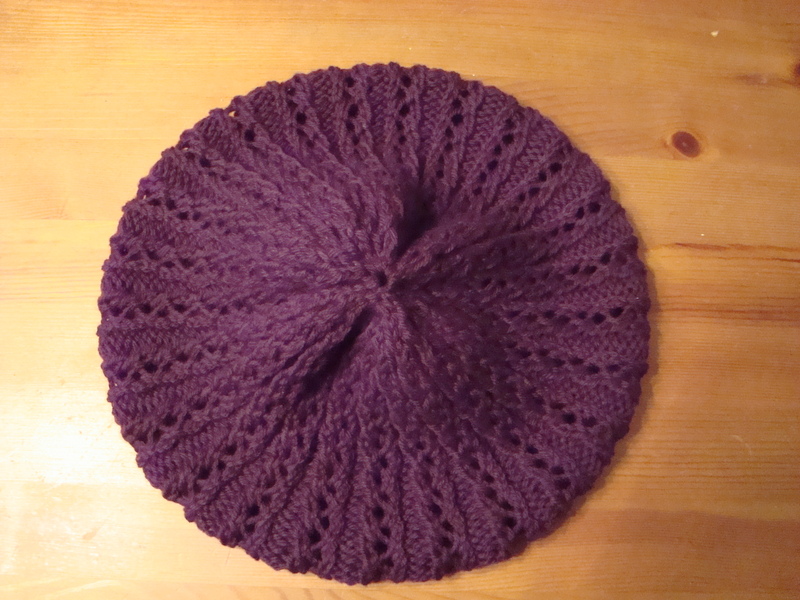 So far I’ve done the brim (3 inches – I wasn’t paying attention!) and 2 pattern repeats. This hat needs to be finished by the end of this week. I’ve got garter and doilying making to do! The photo I’m posting shows less progress than is accurate, but at least you’ll be able to see the color!